The internet is the fastest deploying technology in world history. It's a 21st Century engine of innovation that provides an open platform for entrepreneurs, visionaries, and kids in their garages to follow their dreams. And it didn't happen by accident. The internet became such a success because government had for decades chosen to let the web grow and thrive without burdensome regulation. But instead of continuing this path of tremendous success, the FCC in 2015 approved a massive regulatory regime called Title II that is already having a detrimental impact on broadband investment and could chill future deployment. In the two years since the FCC enacted Title II, broadband investment has declined by $3.6 billion and experts predict future declines under such an extreme regulatory structure. By reversing Title II, the FCC can restore the successful “light touch” approach that encourages investment and innovation in communities all across America, especially hard to reach rural areas. Instead of imposing outdated public utility regulation on dynamic networks, the FCC should reverse Title II and clear the way for Congress to pass common sense legislation that enshrines open internet principles in statute while supporting the continued growth and expansion of internet networks throughout America. 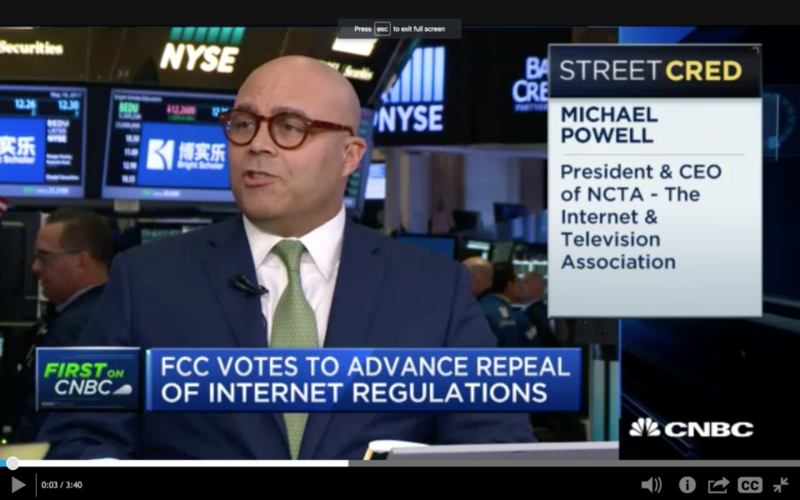 Following Thursday’s FCC vote to advance the Restoring Internet Freedom rule proposal, NCTA President & CEO Michael Powell appeared on CNBC to discuss what those changes could mean. As we’ve stated, our industry supports a free and open internet, and Powell explains how light touch regulation benefits both consumers and network providers.